Collectible vs. Collectable – What’s the Difference? Home » Collectible vs. Collectable – What’s the Difference? Nerd culture has experienced something of a resurgence in American pop culture, and collector culture has always been a huge part of nerd culture. Those with extensive collections of vintage comic books or tabletop games now have plenty of social capital with which to work. Careful word usage, on the other hand, is still not in vogue. Most writers don’t care whether good word choice is in fashion or not—good writing is its own reward. Should you use collectable or collectible? Read this article, and you’ll know. What is the Difference Between Collectible and Collectable? In this post, I will compare collectible vs. collectable. I will use each of these words in at least one example sentence, so you can see them in context. Plus, I will show you a helpful memory tool that will make choosing collectible or collectable a bit easier. What does collectible mean? Collectible can be a noun or an adjective. As a noun, collectible refers to an item valued for its rarity by collectors. Some people collect rare coins or sports memorabilia. Other people collect historical artefacts or replicas of movie props. The market for sports collectibles is fraught with counterfeit items and shady dealers. Collectible can also be used as an adjective, where it describes the quality of being valued by collectors. What does collectable mean? Collectable is an alternative spelling of the same word. Most dictionaries list is as an accepted variant. As a general rule, collectable is the British spelling of the word, and it is much more common in British English than American English. The below charts graph collectable vs. collectible in British and American English, respectively. As you can see, British English users are more likely to use collectable as a general matter than their American counterparts. Interestingly enough, however, their use in British English is much closer when you pluralize the word: collectables vs. collectibles. I’ve isolated the words’ use as nouns by pluralizing them. As you can see, collectibles is now much closer in use to collectable. It’s even a bit higher. As for the American spelling, the same gap remains. As adjectives, the story is a bit different. The British are much more likely to use collectable, while Americans stick with collectible in this sense. None of these charts are 100 percent exhaustive in their scope, since they only look at books published in English since 1800. Still, they clearly illustrate long-term usage trends in these language communities. How to spell collectable: Which word you choose depends on which part of speech you need, and the language preferences of your audience. Americans use collectible as both an adjective and a noun. British writers use collectable as an adjective, and both versions equally as nouns. Since collectible has an I, like the American state of Illinois, you can easily remember to use collectible in American English. Is it collectible or collectable? Collectible and collectable are alternative spellings of a word that can be an adjective or a noun. As an adjective, they mean valuable to collectors. As a noun, they refer to items that are valued by collectors. Britons prefer collectable as an adjective and use both versions as nouns. 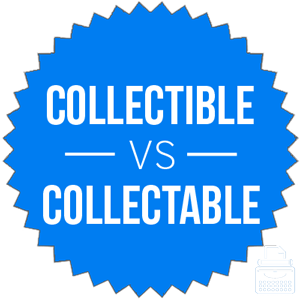 1 What is the Difference Between Collectible and Collectable? Prior vs. Previous – What’s the Difference? Unsatisfied or Dissatisfied – What’s the Difference?